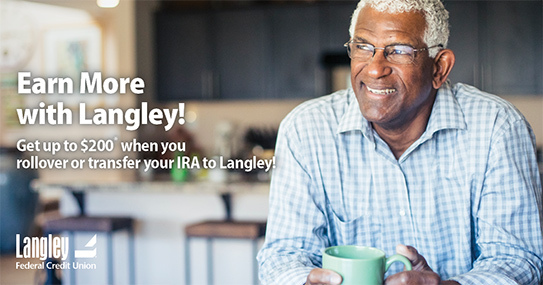 Earn up to $200* when you roll over or transfer your IRA to a Langley IRA Certificate! 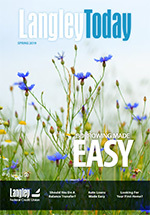 You’ve heard all about them, but if you’re not sure where to start; an Individual Retirement Account at Langley is a great beginning. You might not know the difference between a Roth IRA and a traditional IRA, or a certificate IRA and a money market IRA, but we have the information and guidance you need to make the choice that is right for you. Our IRA Center is the perfect place to start learning about planning for retirement, IRA types, investment tips and more. *Earn $100 when you move a minimum of $10,000, or earn $200 when you move a minimum of $100,000 from your IRA at another institution, through a transfer, rollover, or direct rollover. Both Traditional and Roth IRA's are eligible to transfer and/or rollover. The $100 or $200 will be deposited into your savings account once funds are received. Limited time offer.